January 20, 2012: Rituals Wanted! 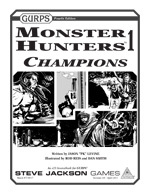 The ritual magic system from GURPS Monster Hunters 1: Champions has been so popular, we're making it into its own standalone GURPS supplement. In addition to greatly expanding and clarifying the system, GURPS Thaumatology: Ritual Path Magic will include a collection of sample rituals to help mages do the impossible. And we need help to complete our summoning: your contributions for this chapter! Be familiar with SJ Games' style guide. Be original! All rituals must be your own original creation; do not adapt anything from literature, film, other games, etc. All submissions become the property of Steve Jackson Games. All authors who have material accepted for GURPS Thaumatology: Ritual Path Magic will receive name credit in the supplement. In addition, the three contributors who provide the most and/or coolest submissions (at our sole discretion) will receive a PDF comp copy of the supplement via e23. If we receive so many awesome submissions that we can do a follow-up Pyramid article with the overflow, we'll follow the same process for them (name credit in that Pyramid issue for everyone, comp copies of that Pyramid issue for the three coolest).